Has this ever happened to you before? You have to be somewhere for something really important like a life changing exams and you have just the right amount of time to reach your school in time except everything depends on the train driver getting you to your train station at the normal speed he is supposed to go. Except just 5 minutes away from your train station, you suddenly feel the train slowing down. And you go: whatthehell whatthehell? Come on man. Go faster, you stupid train. And that's all you can do because there's nothing else you can do. It's beyond your control. And you know you're screwed because you'll be late for your life changing exams. Well, right now I'm doing all I can to make sure I have everything under control. Because you know how I am when I prepare for a craft market. I procrastinate. I don't sew when I'm supposed to sew. I mean I had a lot of time to prepare for this market. A lot. Sure I had a lot going on at home to deal with but I do waste a lot of time doing other stuff like watching every episode of whatever favourite shows I'm following. That's plenty of hours down the drain. So what I'm saying is, I'm sewing my head off before November ends. And you know it will end. Very soon. I don't want to find myself on that train slowing down just 5 minutes away from my stop. In the past, I would plan what I would sew - like x number of this, this and that. This year, in this aspect, I'm out of control. I have no plans. I'm incapable of planning. Whenever I sit down and tell myself to write down what I should make next, I just sit down and stare into space. My planning capability has been completely erased. However, if I just look at a piece of fabric, I would somehow be able to make something, whatever I fancy. 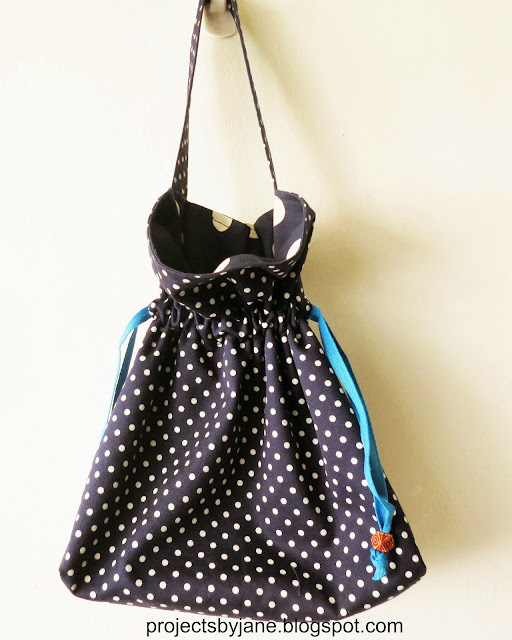 You could say I let the fabric choose the bag. So far it's been working because I managed to make a number of items - maybe not yet enough for a 6-day market but I won't feel ashamed come market day. 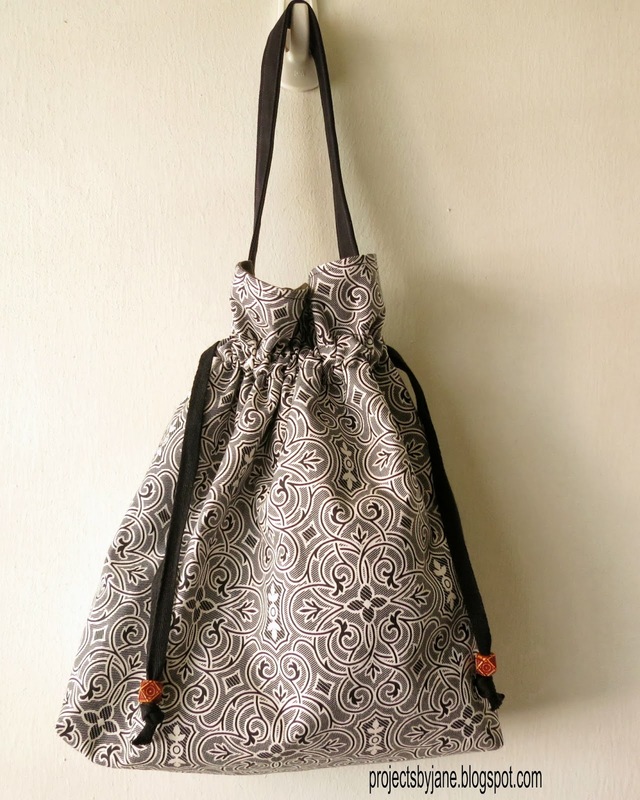 I have 4 drawstring bags this round, nothing fancy but practical items women could use. Still trying to use up my polka dots. These 2 are made from twill and twill is a little hard to photograph especially for the lighter colours. You can see the light bouncing off the "twills". 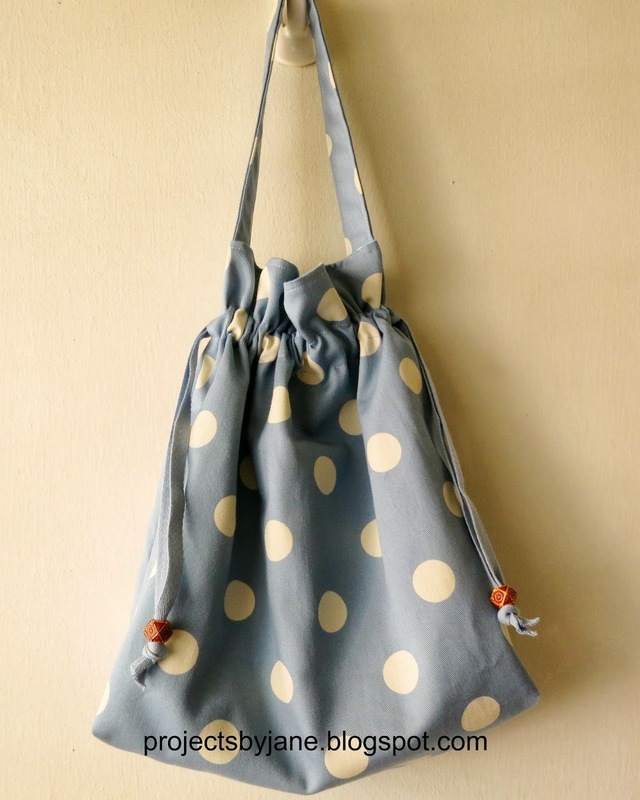 One of my eagle eyed readers spied this fabric which I used as a lining for one of my bags. It's a lovely Anna Griffin fabric and he suggested using it as a outer fabric. 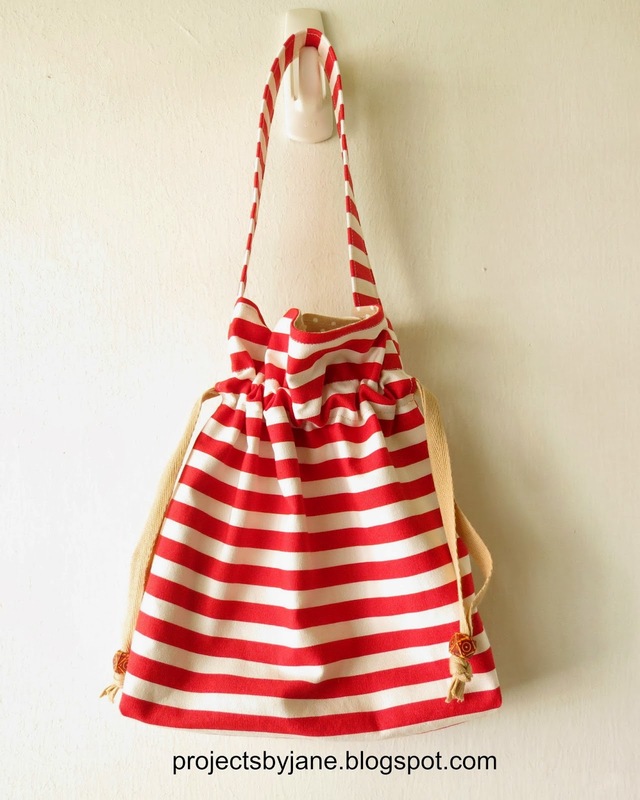 Isn't this red and white stripes drawstring bag soooo cute? I'm using remnants so the size is smaller and I think I made it work. Can you see the polka dots lining peeking out? I don't know what most people use to match red. But I usually like to match it with beige. I think these 2 colours are so perfect together. Am I right? Or is it just me and my shat eyes? I've updated my Christmas catalog HERE. I have decided that I will only post 1 pic per item. The red and white and beige one is my favorite!!!!! 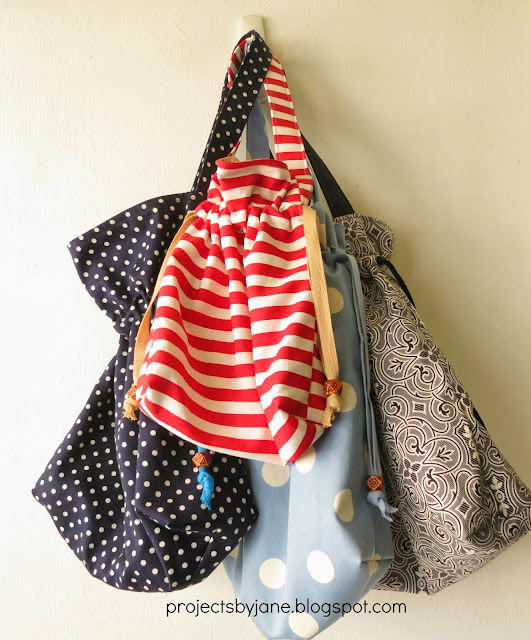 I love all these drawstring bags with handle. Where do you get your beads from Jane? I got the wooden beads from a shop in Singapore. It's a very old-fashioned supply store where time stands still. So of course they don't sell online. I had to buy the beads by the dozen. Their rule. No tens or hundreds. Just dozens. So I bought 9 dozens. Also I had to be interrogated to ensure the owners that I wasn't going to resell the beads. Yes, as if I was going to get rich reselling the beads for profit! Thank you Jane! Happy Thanksgiving! Guess what I am celebrating?